The first appointment of the year and really unprepared for it. It's only two months since the last one but I've already got out of the habit. Traveling up to the London on the train in the morning I realised I hadn't even got a list of questions to ask. When I got to my office I printed off the account of my last trip to Haematology, just to jog my memory (see post - "Bone Marrow Biopsies, Follow-up and Results...well sort of"). I then re-read the post "Managing Consultants and Appointments" to make sure I put into practise what I preach. 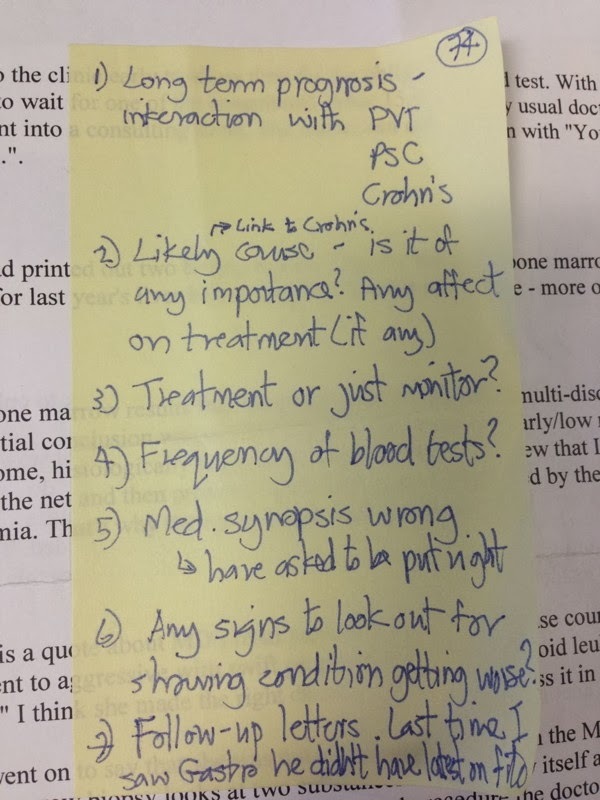 By the time I set off for Guy's Hospital I had managed to write down 7 things I needed to ask or mention on a good, old fashioned Post-It note. Appointment was for 10:00am so arrived 15 minutes early for the obligatory blood test. The phlebotomist asked me if I knew why she was also taking a "histological" sample, but I didn't. Back to the waiting area and at 10:00am my usual doctor appeared, greeted me warmly and we set off for a consulting room. She introduced me ot an American medical student, who was over in the UK to see how things are done in the NHS, and checked that I was OK with someone else present during the consultation. She explained that after the last bone marrow biopsy one of the samples, which should have gone for histological testing, had either been mislaid or mis-labelled so did not make it to the histologist. This is why she had rung me a few weeks back to explain the situation. She had however looked at the other slides from the second biopsy and these were fine. She had discussed the missing sample with the chief histologist and he suggested doing a particular type of blood test which had proved to be 60% effective in spotting problems, if there were any. The results would be available in a week's time. The alternative was to have a third bone marrow biopsy but they didn't want me to put me through that again. I'm really not that fussed. 1) Long term prognosis - will not affect the other issues I have - Crohn's, PSC, PVT. Must avoid use of Azathioprine in the future. Today's platelet count = 74, an increase of 18, but don't get hung up on the numbers as I am currently asymptomatic ie. I don't bleed profusely if I cut myself. 2) Cause of low platelets - no signs of any marrow abnormalaties which could have pointed to a more sinister conclusion ie. leukemia therefore cause is drug induced - long term use of Azathioprine. 3), 4) and 6) Treatment - none required but look out for any signs of starting to bleed more easily. Six monthly blood tests and outpatient appointments. A platelet count of 50 is the threshold for having minor surgery or teeth extraction so no need for special measures at present. 7) Follow-up Letters - this was an area where we had had issues in the past. I requested that follow-up letters were sent out as soon as possible after an appointment as the last time I saw my gastro consultant he was unaware of my bone marrow biopsy etc. She promised to improve the timing in future and would write to me as soon as the histological results were back. I mentioned that as part of the NHS Change Day (3rd March 2014) I had pledged to give feedback to my consultants on the service they provide (whether they wanted it or not!). This was my first chance to put the pledge into action. She thanked me for my feedback. The low platelet issue had originally been "parked" but in September 2013 I felt that we really should investigate it further so we could decide if Azathioprine would still a viable drug for treating my Crohn's and to make sure there wasn't a more serious underlying problem. My gastro consultant supported this and the investigation started. Two bone marrow biopsies later and we have the answer. The low platelets are not indicative of a bone marrow abnormality but are drug induced with the likely cause being to 8+ years of Azathioprine. It is a known side effect of this drug. Azathioprine is sometimes used to maintain Crohn's remission but if I get to the point where I need to go back on medication it will not be considered as an option. The low platelets can return to their parking bay. ...and the implications for other Azathioprine users? The above is just MY experience of taking that drug and as we all react differently to medications you should not assume you will end up in the same situation. Whilst I stopped taking it when we realised there was a potential problem it has not damaged my bone marrow sufficiently to need to take further action. The haematologist described it as like having a "four cylinder engine but only running on three". Would I have agreed to starting Azathioprine back in 1998 if I knew then what I know now? Yes. For nearly ten years it kept surgery at bay so that when the knife became inevitableI was in a much better position both financially and mentally to cope. If you want to read about having a bone marrow biopsy then have a look at "Chapter 15 - Crohn's, Azathioprine and Low Platelet Count"